Jefferson and his family owned an impressive collection of sheet music. 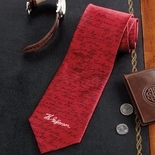 Excerpts from various compositions adorn this elegant, hand-sewn silk tie, a great gift for your favorite musician or music-lover. 3 7/8" wide.